This morning I rode on the Tram to the Star Ferry. The windows open and make the traveling seem cleaner. I thought I'd sneak a picture of the woman across from me. Aren't you glad I wasn't sitting across from you?! I rode the Ferry across the harbor to the Kowloon side and walked the several blocks to the Conference Office. When I had finished my business, I decided to catch the MTR (subway) back to Hong Kong. Then it happened. While waiting for the train, a man sitting on a bench nearby spat a big mouthful all over in front of himself. A few days ago I stood in a market buying some fruit when a woman came and stood beside me eating cooked crab from a Styrofoam tray. The portions she did not wish to eat (shell and claws, antennae etc.) she was spitting on my foot. But this man was grosser than she had been. When he saw me staring at him, which I was doing most likely because there are signs all over the city telling people how to spit, and he obviously didn't know how to follow directions, he said in perfect unslurred English, "don't mind me, I'm drunk". I reported his spit to the station attendant so that it could be cleaned up before someone got it on them. The "drunk" took off on a run and boarded a leaving train. The station attendant called to the next station to report a spit -and - run. While he was doing this, a woman came and sat in the area where the spit-and-run had taken place. This was not to last long. The attendant rushed to tell her of her peril. She lunged away and began to examine herself, her clothing, and her backpack. 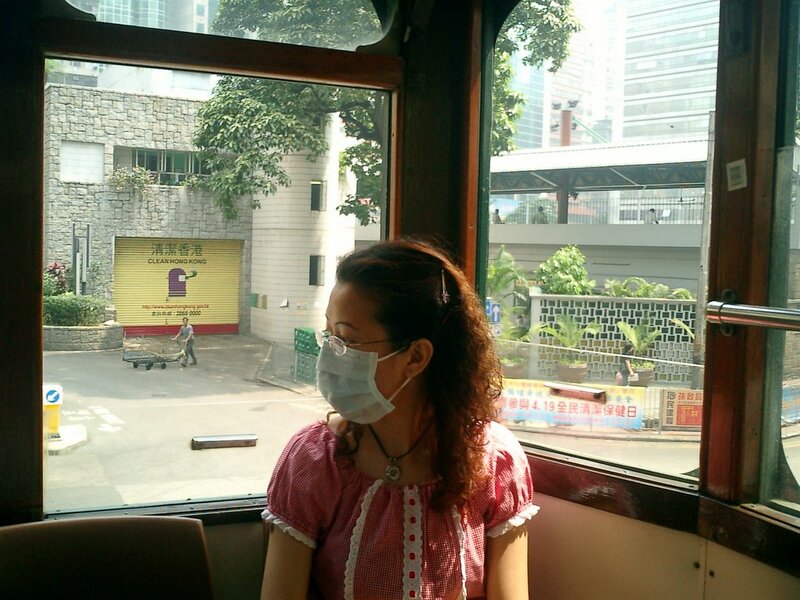 I boarded the Hong Kong bound train and hurried back to my densely populated island. So, read the sign on the garage door in the picture. Clean Hong Kong. Some remain unconvinced. This morning I went early to the Wanchai Tower. It is the headquarters for the Hong Kong Correctional Services Department. Or, Department of Prisons. After being interviewed by a number of persons, a Mr. Ko was very helpful and told me exactly what I will need to do in order to be installed as a Chaplain in the Prison System of Hong Kong. One of our church members has been incarcerated for immigration problems. He was actually quite ignorant that anything was wrong, and was arrested at the airport when re-entering the country from China. I went to visit him last Monday, and it went well. But then I went earlier in the morning. To begin with, Getting there isn't easy. I catch a bus to the Central Bus terminus. There I walk about 10 minutes to the ferry piers for ferries to other Islands, as opposed to taking a ferry to the New Territories. There I catch a ferry to Peng Hau Island. Upon arrival there I normally just walk over to another ferry that leaves from there to the prison Island. This morning, however, I needed to run to the grocery store on the first Island and buy some items that Daniel (our Adventist inmate) needed. A towel and some butter. Daniel didn't really want butter at all, but English is not his first language. He comes from an African nation, and he is often close to the word he wishes to use, but not always right there. He had told me last Monday that he needed some butter so that he could shave. I decided that his wish was for Shaving Cream. So, when he said butter, I thought to myself that I should get him some cream. In my cholesteroled condition, the two are very closely linked. Kind of like... "What is the first thing that comes into your mind when I say 'Butter'?" So, I finally, and it is fortunate, said to Daniel, "you mean Shaving Cream?" He did not. With much discussion, we both eventually realized that what he wanted was batteries. And so this morning I ran to the store and bought the towel (a size and brand that is allowed by the prison system) and the batteries. I am not sure why I didn't question in my mind if the prison system was particular about batteries as they were about towels. Then I ran for the ferry that goes to the prison island. It was leaving. The first mate (mate really, since there are only two crew members on board) remembering me, signaled for the captain to return to the wharf and allow me to board. Thankfully I jumped a little span of salt water just before the boat touched dock again, and we were on our way. At the prison island, we leave the boat and go into a reception area. There they ask us the prisoner's number. I had forgotten to bring the number with me today. But, they don't seem to have many visitors the likes of myself, and they remembered who I was coming to visit. They showed me his photograph, just to be sure, and all was in readiness. I then showed them the articles that I wished given to Daniel. The towel, they took and, approving of the brand, but not the size, cut it in half. The half not allowed to go to prison is in my briefcase for future reference. Then I showed them the batteries. Their English, being like my Chinese, does not lend itself to a lot of explaining, but rather tends towards specific injunctions. So, they looked at the batteries and said, "NO!" I decided that double A was not the right size, seeing a whole box of AAA batteries sitting on the counter. I asked if I could buy a package. No. But, the mate on the little ferry would sell me batteries. I ran back to the ferry, which was for my second approach today, getting ready to leave. They returned, I jumped on board and asked if I could buy batteries. The mate tried to sell me AA batteries. I told him through much sign language that I needed AAA batteries. He tried to dissuade me (possibly having known the workings of prison razors from some previous experience), but I insisted and he handed me the AAA "butter". I jumped ship and ran back to the reception area. The ship sailed and the receptionist told me I had the wrong size, I needed AA. I showed her that those I already had in my possession from the first time I had to jump on board a moving object. Ah, she showed me by much gesticulation, that the brand was not allowed. I had not brought the permissible "Ever Ready" but rather held in my guilty hand "Dura Cell". I tried again to buy batteries from her, but she explained that she sold only AAA, and I needed AA. However, when the ferry returned to take us away from Sing Sing, I could trade the batteries with the mate. Eventually our sad group of visitors was ushered in to visit with the inmates. We were in a fairly small cement room. There were 6 visitors and 5 inmates. Two of the visitors were husband and wife there to visit their son. And all 11 persons and the two guards who kept watch over our visit began speaking at once. The curtainless, carpetless, non-upholstered room, refused to absorb one word of what was being said, and there we sat shouting in an echo chamber. 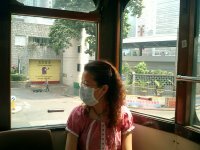 All of us were required to wear masks to prevent infecting either inmate or guest with SARS. And it was impossible to know what Daniel was saying to me. Daniel has a very muscular neck. I realized the physical exercise that has provided him with this pillar-like muscle connecting his head and torso when I tried to listen to him speak today. Not being able to hear him clearly through the muffler that was his mask and the only thing in the room that was absorbing any of the many sounds, I thought I might be able to read his lips. But alas, they were hidden by the mask. I thought, however, that just his body language might help to some extent. It was not to be. Daniel bobbed his head around relentlessly as he spoke. It went from side to side, then up and down, and sometimes in a circular undulating motion. It was like he was dancing and sitting down at the same time. My neck too would be grand, allowing me to lift barbells with my chin, if I kept my head in motion like that whenever I wished to speak. I could only try to remain focused on his mask. His eyes opened and closed as he described prison life. Now and then there might be a lull in the bedlam coming from right and left and I would hear Daniel tell me that the guards were good to him. He told me in a quiet moment that they like to practice their English with him. And I could envision having to bring a couple of cows to the island to furnish enough butter for everyone's' razors. I tried to just watch his mask. Maybe I could read his lips through the mask. No, it was like trying to figure out what was being said by watching the vibrations on an eardrum. But Daniel was so happy that I was there to visit him, and I told him I was sorry for being old and deaf. He assured me that I was loved and forgiven. What an inspiration Daniel always is when I visit him. He is learning to use the computer. He is so excited. He told me once that the view and the food are both wonderful, and he has so many nice friends. Visiting hours ended and I hurried back to reception. It would be another 30 minutes before the arrival of the boat. I waited, holding the AAA butter in one hand and the Dura Cells in the other. When the boat that I would take (since there seem to be some for other lonely islands also leaving from the same pier) finally arrived, I was given the nod by the officer in charge of batteries and half-towels, to go and make my exchange. I rushed out and ran the length of the pier. I found the salty mate and showed him what he had tried to tell me at the time I got the batteries... I had the wrong size. He gave me the correct size and I ran back, delivered the approved Ever Readys and then ran back to the boat. Of course, I was late for the third time that day. Many people lined both sides of the stairs that went down into the briny deep. The tide was out, so the stairs were long and covered with barnacles below the high-water mark. I will probably never know if it was intentional, but one of the young ladies near the top of the stairs stuck out her foot just enough to stop mine as I passed. I was hurrying, however, so as not to miss the boat, and even though my foot stopped, my upper body (actually everything from my ankles on up) kept on moving. I was being hurled down the steps, much to the enjoyment of the 25 or so bystanders. Their amusement was short-lived, however, as I flailed towards my salt bath. My waving arms and legs were snagging innocent and guilty on-lookers, and a good-sized group of us were headed towards a watery grave. Three stout men near the bottom step, managed to spread themselves across the path and stop the wall of humanity that was accompanying the komakazi pastor from America. I jumped on the waiting boat and we left. Even though I was too shamed to look those left on land in the eye, I did get out my camera and snap a couple of photos of the sober little gathering that were wondering if they might be safer if I were behind bars. I already have a regulation towel.